Manos and other stone implements used for food processing at the Harrell site. 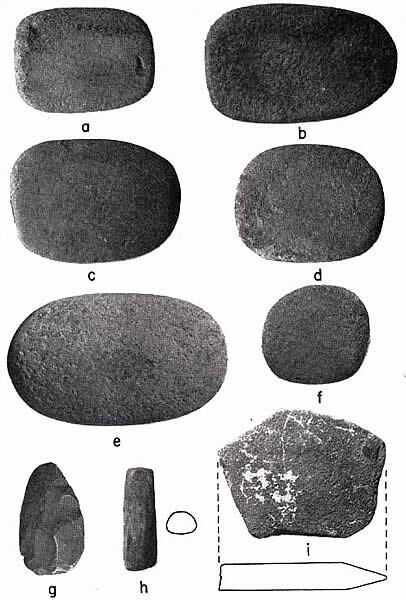 Pecked, or shaped, grinding tools such as manos ( a-e) were handheld and likely moved in a back and forth motion on a metate or coarse grinding slab. The small, unshaped sandstone mano (f) was used in a rotary motion. Item g is a chipped hematite blade, h, a polished sandstone cylinder-shaped object, and i, a fragment of a beveled-edge sandstone tablet. (Krieger 1947, Figure 12).